On the 13th of February we will explore how Artificial Intelligence and Robots are transforming the world of production and service. 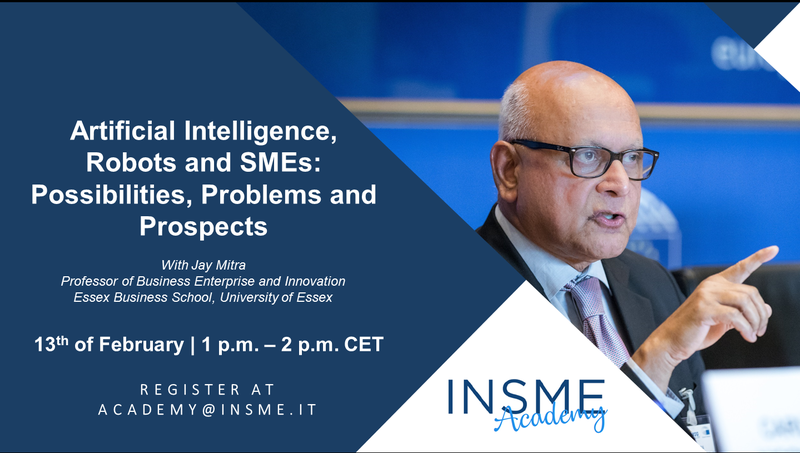 By benefitting from the expertise of our speaker Prof Jay Mitra we will discover the impact of new, dynamic technologies on small, medium and large businesses as well as how SMEs can successfully manage this disruptive change and exploit it at its maximum extent. More details about the session are available at this page.We invite you all to save the 13th of February in your agenda and send an e-mail including your contact details to academy@insme.it to secure your participation to the webinar. The INSME Team is looking forward to receiving your registration and is at your disposal for any clarification you may need.